When we first meet Lily “Lil Bit” Dalton, she is quite literally drowning. This “lip flapping” event, along with others, takes place in the quirky, yet racially divided waterway township of Arcadia, Florida in 1954. 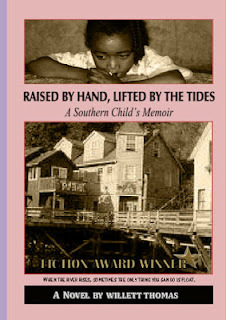 In Raised by Hand, Lil Bit recounts the years between ten and thirteen spent in the care of the woman she considers to be her grandmother, "Bubbah," and this woman's alcoholic son, Bobby. As the story opens, it’s been five years since Lil Bit’s mama, Violet, “dropped her off like nothin’ but a bit of dirty laundry,” when on “Ditch Thursday,” Lil Bit is pulled from the river by Sheriff Marin. The Sheriff’s act of heroism leaves her not only with the secret of what lies beneath the water, but also with gnawing doubts about Sheriff Marin, “the only white man worth a damn in all of Arcadia,” who also knows the river’s secret, but tells no one. Like the tales told by the young heroines in the classics To Kill a Mockingbird and the Secret Lives of Bees, Lily “Lil Bit” Dalton’s quest to reunite with her mother, while also keeping the secret of the Massaquatta’s murky depths, takes readers on a tumultuous ride filled with adventure and mystery. But more importantly, Raised by Hand answers the age old question: What does it take to be a family? Willett Thomas is the President of Write of Passage, Inc. She earned her MA in writing from Johns Hopkins. She has received artist fellowships from Blue Mountain Center and the Millay Colony. She was selected as a Mid-Atlantic Arts Foundation fellow for the District of Columbia. She is the recipient of the 2008 Maureen Egen Writers Exchange award for fiction. I received this book from the author for a review and I am truly thankful to her for this as otherwise I would have never got the chance to read such a wonderfully written book. Emotions, drama, pain, hurt and the trauma of being subjected to something on the basis of your skin colour is something beyond my imagination. And this is exactly what the author has managed to capture beautifully in this book of hers. Set in the 1950’s the backdrop of the book is the discrimination between the blacks and the whites at that time. It feels very painful to read a fellow human being treating another one like this. The narration is very gripping and the pace so quick that you would not want to put it down. The author has managed to grasp the human emotions very well creating a very touching impact on the readers. On completing I felt glad to not have witnessed such a disturbing era I also felt sad that despite being in the 21st century there is still a lot of discrimination that still exists around us. A truly wonderful read, a must have on one’s book shelf sheerly for the magic the author has been able to re-create with her words. No wonder it won accolades for her!